Every woman is different, and as bridesmaids, your friends deserve to look their best. One of the best ways to highlight your bridesmaids’ individual styles is to have mismatched bridesmaid dresses rather than identical gowns. It’s impossible to find the perfect dress for every size, shape, and figure. That’s why more brides this season are thinking outside the box when it comes to bridesmaid style. 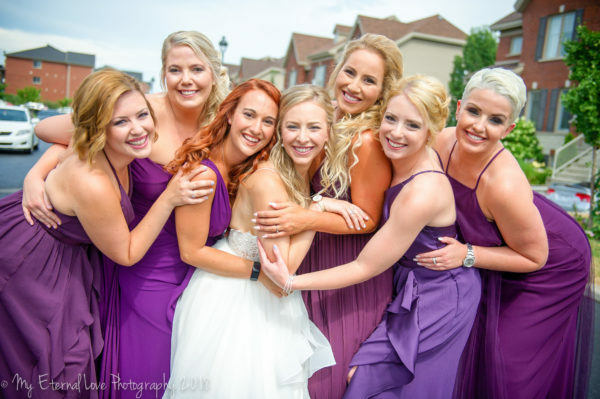 If you want to have mismatched dresses at your wedding, you need one unifying element to bring all the looks together, both for the pictures and so guests can differentiate who’s in the wedding party. The best way to pull this off is to tie every look together with a common colour or pattern. Maybe everyone wears floral. Maybe the colour palette is shades of purple. If you opt to choose all the dresses, pick a theme (pastels are always beautiful) and find complementary dresses in similar silhouettes. Or, choose a convertible dress, that can be worn a dozen different ways, so your ladies can customize how they wear the gown on the big day. Next, decide if you want matching accessories or if you want those to be mismatched as well. There are two ways to knock the mismatched trend out of the park: you can choose the gowns yourself or let your wedding party choose for themselves. If you already have enough on your plate, you can ask your bridesmaids pick their own dresses. Give them a guideline and then let them go from there. This is perfect for friends and family members with distinct styles and different budgets! At my own mismatched wedding, my maid of honour found her gorgeous dress for less than $100 and then customized it, while another bridesmaid found a designer dress from Kleinfeld’s that was closer to $500. In the end, I gave them the freedom to choose what to wear and how much to spent, and everyone felt more confident and beautiful because of it. Subscribe to our newsletter and get the latest news directly in your inbox.